Secrets have a way of floating to the surface. . . . Mystery, compelling characters, and an abandoned town beneath a lake make for a must-read adventure. I read this book very quickly and when I was done, I definitely wanted more. I wasn't quite sure where this book was going -- it was one I picked at random on my kindle on a long train ride -- so I didn't know what to expect, and was pleased to see that it was a simple story about Cassie trying to unravel a mystery. At times this story just felt like sketches of a larger universe. We get enough detail about the characters and the history of the town to be able to make the story work, but also the sense that there could be a much fuller picture if we spent more time in the story. The writing has a dreamy quality about it, and there's almost a feeling of magical realism, although the story isn't fantasy in the slightest (that I can tell). I really enjoyed McKinlay's writing style here, and it worked very well with the whole theme of an underwater/drowned town. I did at times forget how old Cassie is supposed to be. She's around 12, but sometimes the narration felt much older than that in tone, and sometimes she just seems more mature and thoughtful than your average pre-teen. I really liked her, though, as well as her relationship with her family (both of her parents are actually there! and involved! and don't just disappear!) and friend Liam. I kept expecting romance to bloom between them, whenever I forgot that she was 12. There's nothing of the sort happening there, though, Cassie and Liam are just friends who learn to work together to uncover a mystery that they didn't even know they were searching for in the first place. 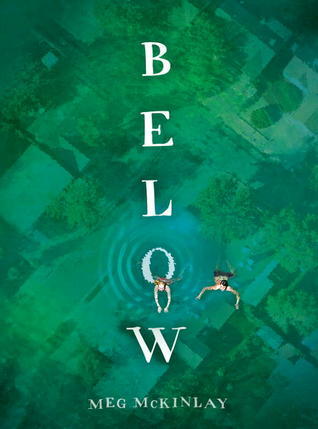 The ending of Below approaches quickly, with the mystery being solved in just the last few pages of the book. This is where I would have wanted a little more, because the "and then this is what happened" wrap up felt very rushed. Overall I enjoyed the read, though, it was a great way to pass an hour or so. It's a clean read, with only a few references to a violent car crash and a past character death that is only mentioned.